These jugs were heavily built with earthenware clay and then carved with designs that reflect both the flora and the culture of New Zealand. 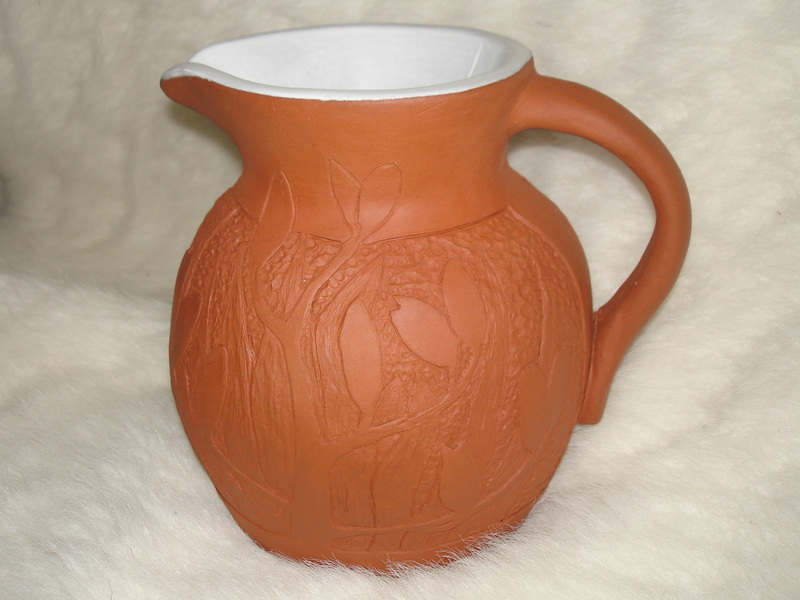 The first jug is finely carved and textured with a flax design. It is glazed internally with a smooth, plain white glaze that creates a strong contrast to the warmth of the bare terra-cotta exterior. It's weight makes it great for displaying tall, top heavy flowers and dried arrangements but not the thing for table ware. coru design. The carving is inlaid with black slip and the jug is glazed on the outer surface with a clear glaze. There is no internal glaze so the jug is good for decoration only.